The network of narrow ridges south of El Montanon Ridge on Santa Cruz Island, seemed like Mars, but with a lot of fog. I'm not sure whether it was bad to have the fog, so that we couldn't see how steep and narrow the ridges are; or if a spectacular view would have made up for it. This seems to be a good place for the native plants of Santa Cruz, including the Santa Cruz buckwheat here, with yellow flowers. This seems to be Dudleya cymosa, with the common name of Liveforever. This place atop this ridge south of El Montanon Ridge on Santa Cruz seems to suit it well, although it's very inhospitable. These plants add to the Mars-like feeling atop the ridge. The foxes on the Channel Islands are becoming more common again. They are said to be the size of house cats, but this one seemed smaller than my smaller cat, who is not large. The foxes have been here a long time: perhaps since the end of the last Ice Age. Golden eagles moved in when the bald eagles at the islands found that DDT destroyed their eggshells; I can imagine that a fox would make a great snack for an eagle. Now the bald eagles are coming back, the golden eagles are leaving, and the foxes are multiplying. This was one of a pair, completely unafraid of us, patrolling Santa Cruz Island near the trail south from Scorpion. It's hard to believe that the grass in this image is an invasive species, but I believe it's oatgrass, native to Europe. It's interesting to think about what this scene looked like before oatgrass grew here. 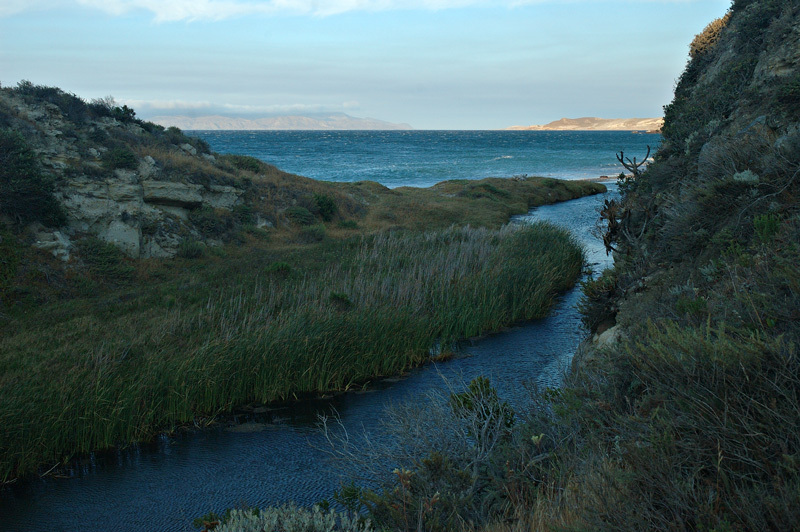 The oatgrass made good pasture for generations of sheep: I think of the sheepherding operations here on Santa Cruz Island, which TC Boyle described convincingly in When the Killing's Done. I'm not sure what, if any, animals depend on it now. It's hard to answer the question: if we want to turn the clock back for the island ecosystem, when should we set it? What species deserve to stay here, and which must die out? It seems to me that the ones that exist only here, or are extremely rare, deserve to stay. Species that other species depend upon deserve special consideration. Species that are so common that they choke out others should be trimmed back. And from my perspective, survival of a species is more important than survival of an individual. The anise swallowtail butterfly may be native to California including the Channel Islands; although it may have moved here from back East. However, the sweet fennel that its caterpillar feeds upon is invasive. 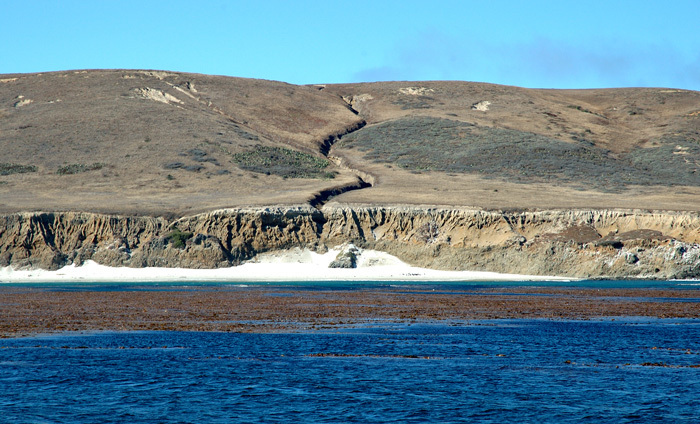 In fact, it choked off huge sections of Santa Cruz Island: achieving 50 to 90% coverage in spots. It is native to Europe: in Greek it gave its name to a famous battle, and race to commemorate the messenger: marathon. It's thought to have escaped from gardens, perhaps on the island or simply as a hitchiker from the mainland. It has the potential to increase coverage still further, as the climate changes. As I've found in my backyard, it's hard to get rid of: I don't like to use herbicides, so I usually cut it down each time it appears, and dig out what roots I can. After a few years, the roots often dry up completely. I spared this plant for the caterpillar. 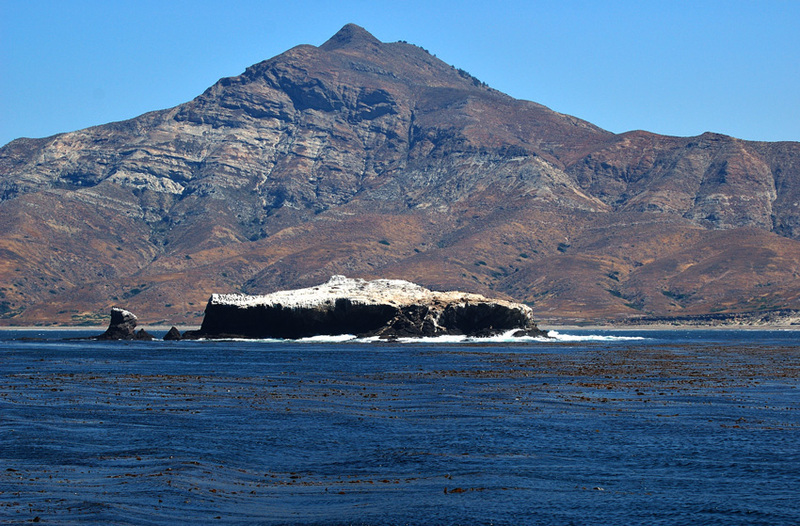 San Miguel is smaller than Santa Cruz and Santa Rosa, but it still looks pretty big from offshore, near Judith Rock. Arroyo on San Miguel, on the south side near Judith Rock. Gull Island lies off the South side of Santa Cruz Island, 1000 yards south of Punta Arenas, and gives its name to the surrounding marine reserve. Lots of reefs and kelp forests radiate from the rock: it's a great place to dive.